IBM recently released the latest monthly beta of their modern and light weight Java EE 7 server; Liberty 9 beta 2016.1. Previous beta releases of Liberty 9 already performed quite well when it came to Java EE's portable authentication (JASPIC), but weren't perfect yet. In this article we take a look to see if JASPIC support has improved in the latest release. To find out we executed the JASPIC tests against this latest release. For comparison the previous Liberty beta as well as the latest (snapshots) of Payara and WildFly are shown. One thing to note is that previous downloads of recent Liberty betas were always for a full Java EE 7 server. For some inexplainable reason this month's beta is "only" a Java EE 7 web profile. Possibly this is a bug on the download page, as the size that as stated (116 mb) is not the same as the actual archive that's downloaded (94 mb). As can be seen Liberty's JASPIC support has again improved. Including a resource (e.g. Servlet or JSP) into the response now generally works again. 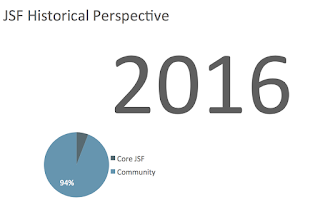 Only JSF based includes are still broken, but this is likely not a Liberty problem but a JSF one. Additionally one CDI problem was fixed; obtaining and invoking a CDI bean from a SAM's cleanSubject method. This already worked on previous betas when the request was to a protected resource, but mysteriously failed for public resources. The cleanSubject method is generally somewhat easier to support, as this method is called in response to HttpServletRequest#logout and thus happens during the so-called resource invocation (i.e. from the context of a Servlet where CDI already is mandated to be available). The real challenge for JASPIC implementors is to make sure that CDI works before and after this resource invocation. Payara, GlassFish and JBoss/WildFly have succeeded in supporting this, but Liberty not yet. This support is particularly important since the upcoming Java EE Security API (JSR 375) completely depends on the ability to obtain and invoke CDI beans from the validateRequest and secureResponse methods. Unfortunately early versions of the JSR 375 API can now not be tested on Liberty. Liberty is improving rapidly and already very useful to deploy portable Java EE 7 authentication modules on. Hopefully it will soon take one the last hurdles and provide full support for CDI as well.